"Consensus" redirects here. For the distributed computing problem, see Consensus (computer science). For other uses, see Consensus (disambiguation). For the Wikipedia policy on consensus, see Wikipedia:Consensus. Members of the Shimer College Assembly reaching a consensus through deliberation. Consensus decision-making is a group decision-making process in which group members develop, and agree to support a decision in the best interest of the whole group or common goal. Consensus may be defined professionally as an acceptable resolution, one that can be supported, even if not the "favourite" of each individual. It has its origin in the Latin word cōnsēnsus (agreement), which is from cōnsentiō meaning literally feel together. It is used to describe both the decision and the process of reaching a decision. Consensus decision-making is thus concerned with the process of deliberating and finalizing a decision, and the social, economic, legal, environmental and political effects of applying this process. Agreement Seeking: A consensus decision-making process attempts to generate as much agreement as possible. Collaborative: Participants contribute to a shared proposal and shape it into a decision that meets the concerns of all group members as much as possible. Cooperative: Participants in an effective consensus process should strive to reach the best possible decision for the group and all of its members, rather than competing for personal preferences. Egalitarian: All members of a consensus decision-making body should be afforded, as much as possible, equal input into the process. All members have the opportunity to present, and amend proposals. Inclusive: As many stakeholders as possible should be involved in the consensus decision-making process. Participatory: The consensus process should actively solicit the input and participation of all decision-makers. Better decisions: Through including the input of all stakeholders the resulting proposals may better address all potential concerns. Better implementation: A process that includes and respects all parties, and generates as much agreement as possible sets the stage for greater cooperation in implementing the resulting decisions. Better group relationships: A cooperative, collaborative group atmosphere can foster greater group cohesion and interpersonal connection. Consensus is not synonymous with "unanimity"– though that may be a rule agreed to in a decision making process. The level of agreement necessary to finalize a decision is known as a "decision rule". Providing an option for those who do not support a proposal to “stand aside” rather than block. Requiring a block from two or more people to put a proposal aside. Requiring the blocking party to supply an alternative proposal or a process for generating one. Limiting each person’s option to block consensus to a handful of times in one’s life. Limiting the option of blocking to decisions that are substantial to the mission or operation of the group and not allowing blocking on routine decisions. Limiting the allowable rationale for blocking to issues that are fundamental to the group’s mission or potentially disastrous to the group. Declare reservations: Group members who are willing to let a motion pass but desire to register their concerns with the group may choose "declare reservations." If there are significant reservations about a motion, the decision-making body may choose to modify or re-word the proposal. Stand aside: A "stand aside" may be registered by a group member who has a "serious personal disagreement" with a proposal, but is willing to let the motion pass. Although stand asides do not halt a motion, it is often regarded as a strong "nay vote" and the concerns of group members standing aside are usually addressed by modifications to the proposal. Stand asides may also be registered by users who feel they are incapable of adequately understanding or participating in the proposal. Object: Any group member may "object" to a proposal. In groups with a unanimity decision rule, a single block is sufficient to stop a proposal. Other decision rules may require more than one objection for a proposal to be blocked or not pass (see previous section, Decision rules). All attempts at achieving consensus begin with a good faith attempt at generating full-agreement, regardless of decision rule threshold. In the spokescouncil model, affinity groups make joint decisions by each designating a speaker and sitting behind that circle of spokespeople, akin to the spokes of a wheel. While speaking rights might be limited to each group's designee, the meeting may allot breakout time for the constituent groups to discuss an issue and return to the circle via their spokesperson. In the case of an activist spokescouncil preparing for the A16 Washington D.C. protests in 2000, affinity groups disputed their spokescouncil's imposition of nonviolence in their action guidelines. They received the reprieve of letting groups self-organize their protests, and as the city's protest was subsequently divided into pie slices, each blockaded by an affinity group's choice of protest. Many of the participants learned about the spokescouncil model on the fly by participating in it directly, and came to better understand their planned action by hearing others' concerns and voicing their own. The group first elects, say, three referees or consensors. The debate on the chosen problem is initiated by the facilitator calling for proposals. Every proposed option is accepted if the referees decide it is relevant and conforms with the UN Charter on Human Rights. The referees produce and display a list of these options. The debate proceeds, with queries, comments, criticisms and/or even new options. If the debate fails to come to a verbal consensus, the referees draw up a final list of options - usually between 4 and 6 - to represent the debate. When all agree, the chair calls for a preferential vote, as per the rules for a Modified Borda Count, MBC. The referees decide which option, or which composite of the two leading options, is the outcome. If its level of support surpasses a minimum consensus coefficient, it may be adopted. 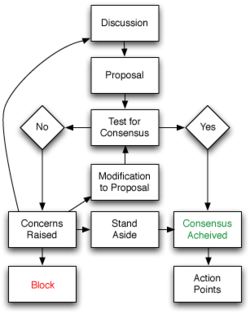 Flowchart of basic consensus decision-making process. Groups that require unanimity commonly use a core set of procedures depicted in this flow chart. Discussion of the item: The item is discussed with the goal of identifying opinions and information on the topic at hand. The general direction of the group and potential proposals for action are often identified during the discussion. Formation of a proposal: Based on the discussion a formal decision proposal on the issue is presented to the group. Call for consensus: The facilitator of the decision-making body calls for consensus on the proposal. Each member of the group usually must actively state whether they agree or consent, stand aside, or object, often by using a hand gesture or raising a colored card, to avoid the group interpreting silence or inaction as agreement. The number of objections is counted to determine if this step's consent threshold is satisfied. If it is, dissenters are asked to share their concerns with proceeding with the agreement, so that any potential harms can be addressed/minimized. This can happen even if the consent threshold is unanimity, especially if many voters stand aside. Identification and addressing of concerns: If consensus is not achieved, each dissenter presents his or her concerns on the proposal, potentially starting another round of discussion to address or clarify the concern. Modification of the proposal: The proposal is amended, re-phrased or ridered in an attempt to address the concerns of the decision-makers. The process then returns to the call for consensus and the cycle is repeated until a satisfactory decision passes the consent threshold for the group. Quaker-based consensus is said to be effective because it puts in place a simple, time-tested structure that moves a group towards unity. The Quaker model is intended to allow hearing individual voices while providing a mechanism for dealing with disagreements. The Quaker model has been adapted by Earlham College for application to secular settings, and can be effectively applied in any consensus decision-making process. Multiple concerns and information are shared until the sense of the group is clear. Discussion involves active listening and sharing information. Norms limit number of times one asks to speak to ensure that each speaker is fully heard. Ideas and solutions belong to the group; no names are recorded. Ideally, differences are resolved by discussion. The facilitator ("clerk" or "convenor" in the Quaker model) identifies areas of agreement and names disagreements to push discussion deeper. The facilitator articulates the sense of the discussion, asks if there are other concerns, and proposes a "minute" of the decision. The group as a whole is responsible for the decision and the decision belongs to the group. The facilitator can discern if one who is not uniting with the decision is acting without concern for the group or in selfish interest. Ideally, all dissenters' perspectives are synthesized into the final outcome for a whole that is greater than the sum of its parts. Should some dissenter's perspective not harmonize with the others, that dissenter may "stand aside" to allow the group to proceed, or may opt to "block". "Standing aside" implies a certain form of silent consent. Some groups allow "blocking" by even a single individual to halt or postpone the entire process. Key components of Quaker-based consensus include a belief in a common humanity and the ability to decide together. The goal is "unity, not unanimity." Ensuring that group members speak only once until others are heard encourages a diversity of thought. The facilitator is understood as serving the group rather than acting as person-in-charge. In the Quaker model, as with other consensus decision-making processes, articulating the emerging consensus allows members to be clear on the decision in front of them. As members' views are taken into account they are likely to support it. The consensus decision-making process often has several roles designed to make the process run more effectively. Although the name and nature of these roles varies from group to group, the most common are the facilitator, consensor, a timekeeper, an empath and a secretary or notes taker. Not all decision-making bodies use all of these roles, although the facilitator position is almost always filled, and some groups use supplementary roles, such as a Devil's advocate or greeter. Some decision-making bodies rotate these roles through the group members in order to build the experience and skills of the participants, and prevent any perceived concentration of power. Facilitator: As the name implies, the role of the facilitator is to help make the process of reaching a consensus decision easier. 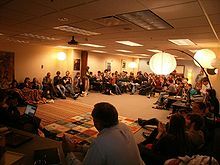 Facilitators accept responsibility for moving through the agenda on time; ensuring the group adheres to the mutually agreed-upon mechanics of the consensus process; and, if necessary, suggesting alternate or additional discussion or decision-making techniques, such as go-arounds, break-out groups or role-playing. Some consensus groups use two co-facilitators. Shared facilitation is often adopted to diffuse the perceived power of the facilitator and create a system whereby a co-facilitator can pass off facilitation duties if he or she becomes more personally engaged in a debate. Consensor: The team of consensors is responsible for accepting those relevant proposals which conform with the UN Charter on Human Rights; for displaying an initial list of these options; for drawing up a balanced list of options to represent the entire debate; to analyse the preferences cast in any subsequent MBC ballot; and, if need be, to determine the composite decision from the two most popular options. Timekeeper: The purpose of the timekeeper is to ensure the decision-making body keeps to the schedule set in the agenda. Effective timekeepers use a variety of techniques to ensure the meeting runs on time including: giving frequent time updates, ample warning of short time, and keeping individual speakers from taking an excessive amount of time. Empath or 'Vibe Watch': The empath, or 'vibe watch' as the position is sometimes called, is charged with monitoring the 'emotional climate' of the meeting, taking note of the body language and other non-verbal cues of the participants. Defusing potential emotional conflicts, maintaining a climate free of intimidation and being aware of potentially destructive power dynamics, such as sexism or racism within the decision-making body, are the primary responsibilities of the empath. Note taker: The role of the notes taker or secretary is to document the decisions, discussion and action points of the decision-making body. 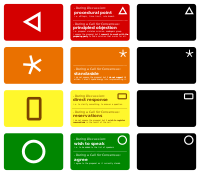 Some consensus decision-making bodies use a system of colored cards to indicate speaker priority. For instance, red cards to indicate feedback on a breach in rules or decorum, yellow cards for clarifying questions, and green cards for desire to speak. Hand signals are another method for reading a room's positions nonverbally. They work well with groups of less than 250 people and especially with multi-lingual groups. The nature and meaning of individual gestures varies between groups, but a widely adopted core set of hand signals include: wiggling of the fingers on both hands, a gesture sometimes referred to as "twinkling", to indicate agreement; raising a fist or crossing both forearms with hands in fists to indicate a block or strong disagreement; and making a "T" shape with both hands, the "time out" gesture, to call attention to a point of process or order. One common set of hand signals is called the "Fist-to-Five" or "Fist-of-Five". In this method each member of the group can hold up a fist to indicate blocking consensus, one finger to suggest changes, two fingers to discuss minor issues, three fingers to indicate willingness to let issue pass without further discussion, four fingers to affirm the decision as a good idea, and five fingers to volunteer to take a lead in implementing the decision. A similar set of hand signals are used by the Occupy Wall Street protesters in their group negotiations. First-past-the-post is used as a fall-back method when consensus cannot be reached within a given time frame. If the potential outcome of the fall-back method can be anticipated, then those who support that outcome have incentives to block consensus so that the fall-back method gets applied. Special fall-back methods have been developed that reduce this incentive. Preservation of the status quo: In decision-making bodies that use formal consensus, the ability of individuals or small minorities to block agreement gives an enormous advantage to anyone who supports the existing state of affairs. This can mean that a specific state of affairs can continue to exist in an organization long after a majority of members would like it to change. The incentive to block can however be removed by using a special kind of voting process. Susceptibility to widespread disagreement: Giving the right to block proposals to all group members may result in the group becoming hostage to an inflexible minority or individual. When a popular proposal is blocked the group actually experiences widespread disagreement, the opposite of the consensus process's goal. Furthermore, "opposing such obstructive behavior [can be] construed as an attack on freedom of speech and in turn [harden] resolve on the part of the individual to defend his or her position." As a result, consensus decision-making has the potential to reward the least accommodating group members while punishing the most accommodating. Stagnation and group dysfunction: When groups cannot make the decisions necessary to function (because they cannot resolve blocks), they may lose effectiveness in accomplishing their mission. Susceptibility to splitting and excluding members: When high levels of group member frustration result from blocked decisions or inordinately long meetings, members may leave the group, try to get to others to leave, or limit who has entry to the group. Channeling decisions away from an inclusive group process: When group members view the status quo as unjustly difficult to change through a whole group process, they may begin to delegate decision-making to smaller committees or to an executive committee. In some cases members begin to act unilaterally because they are frustrated with a stagnated group process. Consensus seeks to improve solidarity in the long run. Accordingly, it should not be confused with unanimity in the immediate situation, which is often a symptom of groupthink. Studies of effective consensus process usually indicate a shunning of unanimity or "illusion of unanimity" that does not hold up as a group comes under real-world pressure (when dissent reappears). Cory Doctorow, Ralph Nader and other proponents of deliberative democracy or judicial-like methods view the explicit dissent as a symbol of strength. In his book about Wikipedia, Joseph Reagle considers the merits and challenges of consensus in open and online communities. Randy Schutt, Starhawk and other practitioners of direct action focus on the hazards of apparent agreement followed by action in which group splits become dangerously obvious. Unanimous, or apparently unanimous, decisions can have drawbacks. They may be symptoms of a systemic bias, a rigged process (where an agenda is not published in advance or changed when it becomes clear who is present to consent), fear of speaking one's mind, a lack of creativity (to suggest alternatives) or even a lack of courage (to go further along the same road to a more extreme solution that would not achieve unanimous consent). Many people think of consensus as simply an extended voting method in which every one must cast their votes the same way. Since unanimity of this kind only rarely occurs in groups with more than one member, groups that try to use this kind of process usually end up being either extremely frustrated or coercive. Either decisions are never made (leading to the demise of the group, its conversion into a social group that does not accomplish any tasks), they are made covertly, or some group or individual dominates the rest. Sometimes a majority dominates, sometimes a minority, sometimes an individual who employs "the block". But no matter how it is done, it is NOT consensus. Confusion between unanimity and consensus, in other words, usually causes consensus decision-making to fail, and the group then either reverts to majority or supermajority rule or disbands. Most robust models of consensus exclude uniformly unanimous decisions and require at least documentation of minority concerns. Some state clearly that unanimity is not consensus but rather evidence of intimidation, lack of imagination, lack of courage, failure to include all voices, or deliberate exclusion of the contrary views. Some proponents of consensus decision-making view procedures that use majority rule as undesirable for several reasons. Majority voting is regarded as competitive, rather than cooperative, framing decision-making in a win/lose dichotomy that ignores the possibility of compromise or other mutually beneficial solutions. Carlos Santiago Nino, on the other hand, has argued that majority rule leads to better deliberation practice than the alternatives, because it requires each member of the group to make arguments that appeal to at least half the participants. A. Lijphart reaches the same conclusion about majority rule, noting that majority rule encourages coalition-building. Additionally, opponents of majority rule claim that it can lead to a 'tyranny of the majority', a scenario in which a majority places its interests so far above those of an individual or minority group as to constitute active oppression. Some voting theorists, however, argue that majority rule may actually prevent tyranny of the majority, in part because it maximizes the potential for a minority to form a coalition that can overturn an unsatisfactory decision. Some advocates of consensus would assert that a majority decision reduces the commitment of each individual decision-maker to the decision. Members of a minority position may feel less commitment to a majority decision, and even majority voters who may have taken their positions along party or bloc lines may have a sense of reduced responsibility for the ultimate decision. The result of this reduced commitment, according to many consensus proponents, is potentially less willingness to defend or act upon the decision. Majority voting cannot measure consensus. Indeed - so many 'for' and so many 'against' - it measures the very opposite, the degree of dissent. Consensus voting, in contrast, the Modified Borda Count, MBC, can identify the consensus of any electorate, whenever such a consensus exists. Furthermore, the rules laid down for this procedure can be the very catalyst of consensus. Outside of Western culture, multiple other cultures have used consensus decision-making. Perhaps the oldest example is the Haudenosaunee (Iroquois) Confederacy Grand Council, which has used consensus in decision-making using a 75% super majority to finalize decisions, potentially as early as 1142. In the Xulu and Xhosa (South African) process of indaba, community leaders gather to listen to the public and negotiate figurative thresholds towards an acceptable compromise. The technique was also used during the 2015 United Nations Climate Change Conference. In Aceh and Nias cultures (Indonesian), family and regional disputes, from playground fights to estate inheritance, are handled through a musyawarah consensus-building process in which parties mediate to find peace and avoid future hostility and revenge. The resulting agreements are expected to be followed, and range from advice and warnings to compensation and exile. Although the modern popularity of consensus decision-making in Western society dates from the women's liberation movement of the 1970s, and anti-nuclear movement the origins of formal consensus can be traced significantly further back. The most notable of early Western consensus practitioners are the Religious Society of Friends, or Quakers, who adopted the technique as early as the 17th century. Anabaptists, including some Mennonites, have a history of using consensus decision-making and some believe Anabaptists practiced consensus as early as the Martyrs' Synod of 1527. Some Christians trace consensus decision-making back to the Bible. The Global Anabaptist Mennonite Encyclopedia references, in particular, Acts 15 as an example of consensus in the New Testament. The lack of legitimate consensus process in the unanimous conviction of Jesus by corrupt priests in an illegally held Sanhedrin court (which had rules preventing unanimous conviction in a hurried process) strongly influenced the views of pacifist Protestants, including the Anabaptists (Mennonites/Amish), Quakers and Shakers. In particular it influenced their distrust of expert-led courtrooms and to "be clear about process" and convene in a way that assures that "everyone must be heard". Consensus voting was first advocated by (a) Ramón Llull in 1199. Next by (b) Nicholas Cusanus in 1435. Then by (c) Jean-Charles de Borda in 1784. Later by (d) Hother Hage in 1860 and (e) Charles Dodgson (Lewis Carroll) in 1884. And finally by (f) Peter Emerson in 1986. With the possible exception of (e), none of these 'inventors' knew anything about the inventions of any of their predecessors. The Oxford English Dictionary credits Mollie Hunter (1922–2012) with following quotation regarding consensus: "No single group has the right to ignore a consensus of thoughtful opinion"
Japanese companies normally use consensus decision-making, meaning that unanimous support on the board of directors is sought for any decision. A ringi-sho is a circulation document used to obtain agreement. It must first be signed by the lowest level manager, and then upwards, and may need to be revised and the process started over. In the Internet Engineering Task Force (IETF), decisions are assumed to be taken by rough consensus. The IETF has studiously refrained from defining a mechanical method for verifying such consensus, apparently in the belief that any such codification leads to attempts to "game the system." Instead, a working group (WG) chair or BoF chair is supposed to articulate the "sense of the group." One tradition in support of rough consensus is the tradition of humming rather than (countable) hand-raising; this allows a group to quickly tell the difference between "one or two objectors" or a "sharply divided community", without making it easy to slip into "majority rule". Much of the business of the IETF is carried out on mailing lists, where all parties can speak their view at all times. In 2001, Robert Rocco Cottone published a consensus-based model of professional decision-making for counselors and psychologists. Based on social constructivist philosophy, the model operates as a consensus-building model, as the clinician addresses ethical conflicts through a process of negotiating to consensus. Conflicts are resolved by consensually agreed on arbitrators who are defined early in the negotiation process. The United States Bureau of Land Management's policy is to seek to use collaborative stakeholder engagement as standard operating practice for natural resources projects, plans, and decision-making except under unusual conditions such as when constrained by law, regulation, or other mandates or when conventional processes are important for establishing new, or reaffirming existing, precedent. As a notable example of the failure of unanimity in the Western canon, New Testament historian Elaine Pagels cites the Sanhedrin's unanimous vote to convict Jesus of Nazareth. To a Jewish audience familiar with that court's requirement to set free any person unanimously convicted as not having a proper defense, Pagels proposes that the story is intended to signal the injustice of unanimous rush to agreement and Jesus' lack of a defender. She cites the shift away from this view and towards preference for visible unanimity as a factor in later "demonization" of Jews, pagans, heretics (notably Gnostics) and others who disagreed with orthodox views in later Christianity. Unanimity, in other words, became a priority where it had been an anathema. Some formal models based on graph theory attempt to explore the implications of suppressed dissent and subsequent sabotage of the group as it takes action. High-stakes decision-making, such as judicial decisions of appeals courts, always require some such explicit documentation. Consent however is still observed that defies factional explanations. Nearly 40% of Supreme Court of US decisions, for example, are unanimous, though often for widely varying reasons. "Consensus in Supreme Court voting, particularly the extreme consensus of unanimity, has often puzzled Court observers who adhere to ideological accounts of judicial decision making." Historical evidence is mixed on whether particular Justices' views were suppressed in favour of public unity. Another method to achieve more agreement to satisfy a strict threshold a voting process under which all members of the group have a strategic incentive to agree rather than block. However, this makes it very difficult to tell the difference between those who support the decision and those who merely tactically tolerate it for the incentive. Once they receive that incentive, they may undermine or refuse to implement the agreement in various and non-obvious ways. In general voting systems avoid allowing offering incentives (or "bribes") to change a heartfelt vote. Abilene paradox: Consensus decision-making is susceptible to all forms of groupthink, the most dramatic being the Abilene paradox. In the Abilene paradox, a group can unanimously agree on a course of action that no individual member of the group desires because no one individual is willing to go against the perceived will of the decision-making body. Time Consuming: Since consensus decision-making focuses on discussion and seeks the input of all participants, it can be a time-consuming process. This is a potential liability in situations where decisions must be made speedily, or where it is not possible to canvass opinions of all delegates in a reasonable time. Additionally, the time commitment required to engage in the consensus decision-making process can sometimes act as a barrier to participation for individuals unable or unwilling to make the commitment. However, once a decision has been reached it can be acted on more quickly than a decision handed down. American businessmen complained that in negotiations with a Japanese company, they had to discuss the idea with everyone even the janitor, yet once a decision was made the Americans found the Japanese were able to act much quicker because everyone was on board, while the Americans had to struggle with internal opposition. Wikimedia Commons has media related to Consensus. ^ "Consensus - Definition". Merriam-Webster Dictionary. Retrieved 2011-08-29. ^ a b "Consensus Decision-making How to use consensus process". Consensusdecisionmaking.org. Retrieved 2011-08-29. ^ a b c d Hartnett, T. (2011). Consensus-Oriented Decision Making. Gabriola Island, BC, Canada:New Society Publishers. ^ Rob Sandelin. "Consensus Basics, Ingredients of successful consensus process". Northwest Intentional Communities Association guide to consensus. Northwest Intentional Communities Association. Archived from the original on February 9, 2007. Retrieved 2007-01-17. ^ "Articles on Meeting Facilitation, Consensus, Santa Cruz California". Groupfacilitation.net. Retrieved 2011-08-29. ^ Kaner, S. (2011). Facilitator's Guide to Participatory Decision-making. San Francisco, CA:Jossey-Bass. ^ Christian, D. Creating a Life Together: Practical Tools to Grow Ecovillages and Intentional Communities. (2003). Gabriola Island, BC, Canada:New Society Publishers. ^ a b "The Consensus Decision Process in Cohousing". Canadian Cohousing Network. Archived from the original on February 26, 2007. Retrieved 2007-01-28. ^ Richard Bruneau (2003). "If Agreement Cannot Be Reached". Participatory Decision-Making in a Cross-Cultural Context. Canada World Youth. p. 37. Archived from the original (DOC) on 2007-09-27. Retrieved 2007-01-17. ^ Consensus Development Project (1998). "FRONTIER: A New Definition". Frontier Education Center. Archived from the original on December 12, 2006. Retrieved 2007-01-17. ^ Rachel Williams; Andrew McLeod (2008). "Consensus Decision-Making" (PDF). Cooperative Starter Series. Northwest Cooperative Development Center. Archived from the original (PDF) on March 14, 2012. Retrieved 2012-12-09. ^ Dorcas; Ellyntari (2004). "Amazing Graces' Guide to Consensus Process". Retrieved 2007-01-17. ^ Jeppesen, Sandra; Adamiak, Joanna (2017). "Street Theory: Grassroots Activist Interventions in Regimes of Knowledge". In Haworth, Robert H.; Elmore, John M. (eds.). Out of the Ruins: The Emergence of Radical Informal Learning Spaces. PM Press. p. 291. ISBN 978-1-62963-319-0. ^ "The Basics of Consensus Decision Making". Consensus Decision Making. ConsensusDecisionMaking.org. 2015-02-17. Retrieved 2015-02-17. ^ What is Consensus?. The Common Place. 2005. Archived from the original on October 15, 2006. Retrieved 2007-01-17. ^ "The Process". Consensus Decision Making. Seeds for Change. 2005-12-01. Retrieved 2007-01-17. ^ a b Quaker Foundations of Leadership (1999). A Comparison of Quaker-based Consensus and Robert's Rules of Order. Richmond, Indiana: Earlham College. Retrieved on 2009-03-01. ^ Woodrow, P. (1999). "Building Consensus Among Multiple Parties: The Experience of the Grand Canyon Visibility Transport Commission." Archived 2008-08-28 at the Wayback Machine Kellogg-Earlham Program in Quaker Foundations of Leadership. Retrieved on 2009-03-01. ^ Berry, F. and M. Snyder (1999). "Notes prepared for Round table: Teaching Consensus-building in the Classroom." Archived 2008-10-11 at the Wayback Machine National Conference on Teaching Public Administration, Colorado Springs, Colorado, March 1998. Retrieved on 2009-03-01. ^ Quaker Foundations of Leadership (1999). "Our Distinctive Approach. Richmond, Indiana: Earlham College. Retrieved on 2009-03-01. ^ Maine.gov. What is a Consensus Process? Archived 2008-12-12 at the Wayback Machine State of Maine Best Practices. Retrieved on: 2009-03-01. ^ a b C.T. Lawrence Butler; Amy Rothstein. "On Conflict and Consensus". Food Not Bombs Publishing. Archived from the original on October 26, 2011. Retrieved 2011-10-31. ^ a b Sheila Kerrigan (2004). "How To Use a Consensus Process To Make Decisions". Community Arts Network. Archived from the original on June 19, 2006. Retrieved 2007-01-17. ^ a b Lori Waller. "Guides: Meeting Facilitation". The Otesha Project. Archived from the original on 2017-03-12. Retrieved 2007-01-17. ^ Berit Lakey (1975). "Meeting Facilitation – The No-Magic Method". Network Service Collaboration. Retrieved 2007-01-17. ^ Jan Havercamp, "Non-verbal communication – a solution for complex group settings", Zhaba facilitators collective, 1999. ^ "A Handbook for Direct Democracy and the Consensus Decision Process" (PDF). Zhaba Facilitators Collective. Archived from the original (PDF) on July 14, 2006. Retrieved 2007-01-18. ^ "Hand Signals" (PDF). Seeds for Change. Archived from the original (PDF) on September 27, 2007. Retrieved 2007-01-18. ^ "Guide for Facilitators: Fist-to-Five Consensus-Building". Freechild.org. Retrieved 2008-02-04. ^ The Salt Lake Tribune. "Utah Local News - Salt Lake City News, Sports, Archive - The Salt Lake Tribune". ^ a b c Heitzig, Jobst; Simmons, Forest W. (2012). "Some chance for consensus: Voting methods for which consensus is an equilibrium". Social Choice and Welfare. 38: 43–57. doi:10.1007/s00355-010-0517-y. ^ The Common Wheel Collective (2002). "Introduction to Consensus". The Collective Book on Collective Process. Archived from the original on 2006-06-30. Retrieved 2007-01-17. ^ Alan McCluskey (1999). "Consensus building and verbal desperados". Retrieved 2007-01-17. ^ Welch Cline, Rebecca J (1990). "Detecting groupthink: Methods for observing the illusion of unanimity". Communication Quarterly. 38 (2): 112–126. doi:10.1080/01463379009369748. ^ Joseph M. Reagle Jr. (30 September 2010). "The challenges of consensus". Good Faith Collaboration: The Culture of Wikipedia. MIT Press. p. 100. ISBN 978-0-262-01447-2. Available for free download in multiple formats at: Good Faith Collaboration: The Culture of Wikipedia at the Internet Archive. ^ Schutt, Randy (August 31, 2010). Consensus Is Not Unanimity: Making Decisions Cooperatively. The Vernal Education Project. Papers on Nonviolent Action and Cooperative Decision-Making. ^ Schermers, Henry G.; Blokker, Niels M. (2011). International Institutional Law. p. 547. ISBN 978-9004187986. Retrieved 2016-02-29. ^ Cline, Rebecca J. Welch (2009). "Detecting groupthink: Methods for observing the illusion of unanimity". Communication Quarterly. 38 (2): 112–126. doi:10.1080/01463379009369748. ^ Consensus is not Unanimity Archived February 21, 2014, at the Wayback Machine, Starhawk. ^ Friedrich Degenhardt (2006). "Consensus: a colourful farewell to majority rule". World Council of Churches. Archived from the original on 2006-12-06. Retrieved 2007-01-17. ^ McGann, Anthony J. The Logic of Democracy: Reconciling, Equality, Deliberation, and Minority Protection. Ann Arbor: University of Michigan Press. 2006. ISBN 0-472-06949-7. ^ a b Anthony J. McGann (2002). "The Tyranny of the Supermajority: How Majority Rule Protects Majorities" (PDF). Center for the Study of Democracy. Retrieved 2008-06-09. ^ M. Paul Keesler (2008). "League of the Iroquois". Mohawk – Discovering the Valley of the Crystals. North Country Press. ISBN 9781595310217. Archived from the original on 2007-12-17. ^ Bruce E. Johansen (1995). "Dating the Iroquois Confederacy". Akwesasne Notes. Retrieved 2007-01-17. ^ "Climate talks turn to South African indaba process to unlock deal". Reuters. 10 December 2016 – via Reuters. ^ Rathi, Akshat. "This simple negotiation tactic brought 195 countries to consensus". ^ Anthony, Mely Caballero (1 January 2005). Regional Security in Southeast Asia: Beyond the ASEAN Way. Institute of Southeast Asian Studies. ISBN 9789812302601 – via Google Books. ^ David Graeber; Andrej Grubacic (2004). "Anarchism, Or The Revolutionary Movement Of The Twenty-first Century". ZNet. Archived from the original on February 17, 2007. Retrieved 2007-01-17. ^ Sanderson Beck (2003). "Anti-Nuclear Protests". Sanderson Beck. Retrieved 2007-01-17. ^ a b Ethan Mitchell (2006). "Participation in Unanimous Decision-Making: The New England Monthly Meetings of Friends". Philica. Retrieved 2007-01-17. ^ Abe J. Dueck (1990). "Church Leadership: A Historical Perspective". Direction. Retrieved 2007-01-17. ^ Ralph A Lebold (1989). "Consensus". Global Anabaptist Mennonite Encyclopedia Online. Global Anabaptist Mennonite Encyclopedia Online. Archived from the original on March 13, 2007. Retrieved 2007-01-17. ^ a b c Elaine Pagels (1996). The Origin of Satan: How Christians Demonized Jews, Pagans, and Heretics. Random House. ISBN 978-0-679-73118-4. Retrieved 23 April 2012. ^ "AT 11: Conflict and Church Decision Making: Be clear about process and let everyone be heard - The Anabaptist Network". ^ Vogel, Ezra F. (1975). Modern Japanese Organization and Decision-making. p. 121. ISBN 978-0520054684. ^ "Ringi-Sho". Japanese123.com. Archived from the original on August 11, 2011. Retrieved 2011-08-29. ^ RFC 2418. "IETF Working Group Guidelines and Procedures." ^ "The Tao of IETF: A Novice's Guide to the Internet Engineering Task Force". The Internet Society. 2006. Retrieved 2007-01-17. ^ Cottone, R. R. (2001). The social constructivism model of ethical decision making. "Journal of Counseling and Development," vol. 79, pp. 39-45. ^ "Bureau of Land Management National Natural Resources Policy for Collaborative Stakeholder Engagement and Appropriate Dispute Resolution" (PDF). Bureau of Land Management. 2009. Archived from the original (PDF) on January 14, 2012. ^ Inohara, Takehiro (2010). "Consensus building and the Graph Model for Conflict Resolution". Error. pp. 2841–2846. doi:10.1109/ICSMC.2010.5641917. ISBN 978-1-4244-6586-6. Archived from the original on May 11, 2013. ^ Epstein, Lee; Segal, Jeffrey A.; Spaeth, Harold J. (2001). "The Norm of Consensus on the U.S. Supreme Court". American Journal of Political Science. 45 (2): 362–377. doi:10.2307/2669346. JSTOR 2669346. ^ Edelman, Paul H.; Klein, David E.; Lindquist, Stefanie A. (2012). "Consensus, Disorder, and Ideology on the Supreme Court". Journal of Empirical Legal Studies. 9 (1): 129–148. doi:10.1111/j.1740-1461.2011.01249.x. ^ Harvey, Jerry B. (Summer 1974). "The Abilene Paradox and other Meditations on Management". Organizational Dynamics. 3 (1): 63–80. doi:10.1016/0090-2616(74)90005-9. ^ "Consensus Team Decision Making". Strategic Leadership and Decision Making. National Defense University. Retrieved 2007-01-17. ^ Tomalin, Barry; Knicks, Mike (2008). "Consensus or individually driven decision-". The World's Business Cultures and How to Unlock Them. Thorogood Publishing. p. 109. ISBN 978-1-85418-369-9. Leach, Darcy K. (February 2016). "When Freedom Is Not an Endless Meeting: A New Look at Efficiency in Consensus-Based Decision Making". The Sociological Quarterly. 57 (1): 36–70. doi:10.1111/tsq.12137. ISSN 0038-0253.